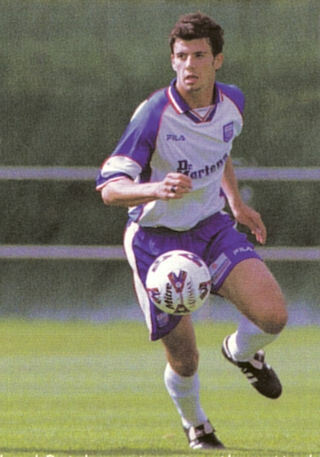 Richard was a former Northampton Town trainee and joined Diamonds youth setup in 1999. He went on to appear in both the Hillier Cup and FA Trophy for the club, but only made the bench as an unused substitute in Conference games. He signed professional forms on 2 March 2000, but failed to make the first team, and was released in May 2001 as Diamonds moved into the Football League, joining Kettering Town. After the Poppies he moved up to the Football League with Lincoln City in November 2002 and made over 100 appearances for them in his first spell at the club. After nearly three years with the Imps, he moved up a League and spent a season with Oldham Athletic, but returned to Lincoln City for a brief loan spell during his time at Boundary Park. He spent the 2006/07 season at Peterborough United teaming up with his former manager at Lincoln – Keith Alexander. After leaving London Road in July 2007, he joined Notts County and played over 90 games for the Magpies, scoring 20 goals.in a two year spell. He was released in the summer, and rejoined Lincoln City for a third spell at the club. On 8 February 2010, he went on loan toMacclesfield Town, scoring on his debut for the Silkmen the following day. After his release at the end of the season, he joined Macclesfield Town on a permanent basis on 20 May 2010. Sadly on 10 January 2011, he was found dead in his home in Greater Manchester having passed away in his sleep.